« Sponsorship: is there an alternative? Over the years I’ve spent on the road I’ve got used to the fact that when I need help, help will appear – although I’ve never stopped marvelling at it. Sometimes it’s positively magical – I could tell you several stories of times when I’ve been cycling along, desperately fantasizing about what it is I most need or want at that moment, only to have it handed to me within minutes. You’ve already heard about the time I started to get hungry in Northern Japan and someone appeared at the side of the road with a hamburger. And there was another time, in China, where I struggled through a 100+ mile day to get to Urumqi before my contact went on a business trip, filthy, sunburned and saddlesore, distracting myself by dreaming about my triumphant homecoming (I often did this), and imagining that some millionaire would have read my blog, decided I was in need of a bit of a reward for all that cycling, and offer to send me to one of London’s finest spas for a weekend. Within minutes of getting off the bike that evening, in the lift up to Lili’s penthouse apartment, she casually mentioned that we were going to a spa the following day, and within 24 hours I was being steamed and and scrubbed and massaged and pampered just as I had secretly been longing for. A friend of mine always used to say ‘the universe will provide’. And I’ve come to find that it does, or at least it does when I’m travelling by bike. The world isn’t always this generous to me, but something in the combination of a lone person (woman? ), travelling on a bike and possibly looking a little lost or needy, seems to open people’s hearts. One of the reasons I love cycling so much is that I always seem to be in the right place at the right time. When I need something, I find it. Or rather, it finds me – or in fact, what actually seems to happen is that the person who’s able to help me senses that I need them and comes to the rescue. I’ve become used to the way this happens. It means that I’m no longer afraid of people – as I used to remind myself in Iran, even if I do meet the one or two people who wish me harm, I’ll eventually be taken in, sorted out, and put back on my bike by the other 99%. I came across a new word yesterday: pronoia. It’s the exact opposite of ‘paranoia’; the belief that there exists a worldwide conspiracy to help me. And I am more and more – what would you call it? – pronoid. As you’ll have noticed from my last post, I’ve grown so firm in this belief that I’ll be looked after that I’m now mustering the courage to ask for help when I need it, without worrying that people will consider me greedy or grasping (though I still worry that I am). 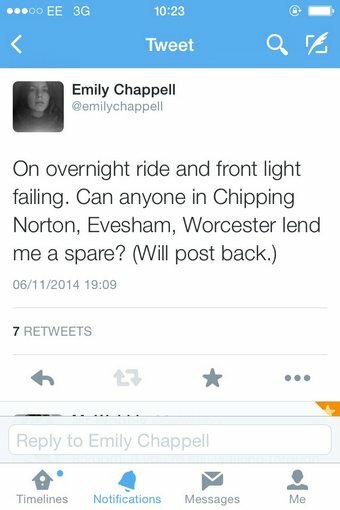 The other night, for example, I was somewhere on the A44 between Oxford and Chipping Norton when my front light started to fail. Annoying, as I had quite a lot further to go, and it was going to be dark for another 12 hours or so. Smartphones really are wonderful, aren’t they? I’m a very late adopter, but my iPhone has already become happily indispensable. I was still a couple of hours off, concerned that I’d keep him up past his bedtime, or annoy him by getting to Worcester and then spending an extra two hours trying to find his house. I needn’t have worried. 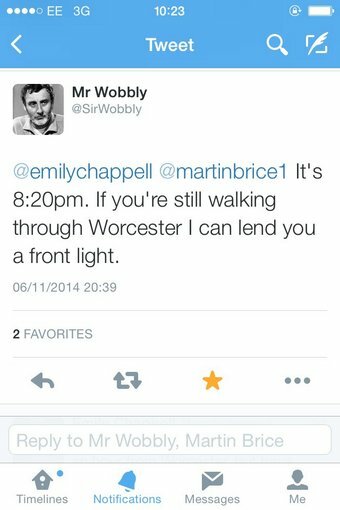 A few miles before Worcester I became aware of a car parked up ahead of me, and a shadowy figure standing out in the middle of the road, flagging me down. “Are you looking for a light, by any chance?” asked the shadowy figure. “Funny you should mention it…” I grinned, pulling into the layby. 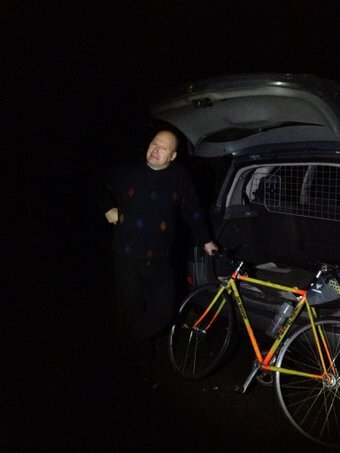 I couldn’t quite believe that he would have come out in his car in the middle of the night, just to lend a bike light to a stranger, but things became a little clearer when he explained that he was a longtime Audax rider, and as such, perfectly accustomed to hanging around on A roads in the middle of the night, in the company of sleep-deprived people in lycra. Unlike most of the people I’d encountered in service stations so far, he seemed not to think it at all unusual for a person to be out in the rain on her way to Wales while everyone else watched telly and went to bed. “I’ve been given a lot of help myself, over the years” he explained, passing me selections from the range of lights spread out on his back seat. It looked very much as if he’d brought along his entire collection. I accepted a very bright front light, and he convinced me to take an extra back one as well, tutting maternally over what might happen if my only other red light fell off and I didn’t notice. He gave a cheeky grin, and handed me a pack of Snickers bar, and a couple of bags of dried fruit, and some energy bars, and a bottle of water, gleefully piling up the food until my arms were in danger of overflowing. Then he spent a few minutes telling me how I really should consider riding Paris-Brest-Paris next year, reminiscing about the four times he himself had done it, asked if there was anything else I needed, told me to get in touch if I needed rescuing within the next two hours, and sent me on my way, passing me with a cheery toot of his horn a moment later. ‘Am I hallucinating?’ I wondered. But no, there it was – the road ahead of me, lit up once again by the beams of my saviour’s 200-lumen front light. And when I checked my phone the following day I remembered that I’d taken a photo of him, his black jersey disappearing into the darkness around him, looking very much like he might well be a ghost after all – or the guardian angel that (to me, at least) he was.